There are view things that I look forward to like a good summer vacation, or a vacation anytime for that matter. This year, Marcy, Melissa and I were going on a cruise! Michelle, unfortunately, had to stay home for work and, of course, take care of the cats. I found this cruise back in March, with four sea days and three stops; San Juan, Puerto Rico, St. Thomas, US Virgin Islands and Grand Turk, of the Turks and Caicos Islands. I don't mind the days at sea, because that's a great time to relax, read and listen to music on the deck. Our ship was the Carnival Sunshine, formerly the Destiny. The ship, built in 1996; renovated in 2005 and, again, in 2010 and refurbished in 2013 to meet Carnivals Fun Ship 2.0 standards. The refurbishing included a new waterslide, new specialty restaurants, all new cabins and public areas. This was taking an older ship and making it a new ship, hence the name change. The Sunshine wasn't the largest or the smallest ship we rode. The first cruise we ever did was out of Port Canaveral, Florida on Premiere Cruise Lines Big Red Boat called the Majestic; it was only 17,000 gross tonnage. The largest we've ever been on was Royal Caribbean's Liberty of the Seas,; it was almost 156,000 gross tonnage. The Sunshine is roughly 100,000 gross tonnage. Yet, for some reason, it felt small. Deck 3 was the lobby, which had the Sunshine Bar and Atrium, Deck 4 had the shops, and Deck 5 had The Liquid Lounge theatre, for the big shows, and The Limelight, for the smaller shows, such as the comedians. There really wasn't any one place inside to just hang out and do nothing. I did enjoy visiting the Library Bar, which is small and quiet. I also borrowed a couple of books. 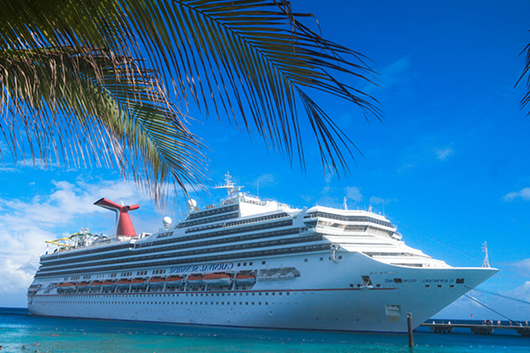 Food and entertainment are main reasons for taking a cruise. Two reasons people cruise to eat and be entertained. How many times can you keep going back to the buffet? I watched people leave it with two full plates and go back for more. I couldn't do that. I did not over indulge and, actually, ate less as the cruise sailed on. The entertainment was good. The cruise director sets the tone of any cruise and Emma Nixon, was no exception. She was very nice young woman from England, with a great sense of humor. I had read reviews of Emma Nixon, on line, and told her so. She said that she didn't read that stuff. I told her that she probably should. We had two comedians and a magician the first half of the cruise, with another two due on board for the second half. One comedian made it, but the second didn't. The first comedian we saw was Will Marfori. He's been doing stand up for about twenty years. He lives in Memphis with his wife and kids. His "shtick" is to poke fun at himself. He has cerebral palsy (CP). His comedy also focuses on how CP has affected his life. I talked with him for an interview; that's a column for another day. The second comic was the well-known John Mulrooney. He's a thirty-year comedy veteran and on television many times, including hosting the Fox TV show "Comic Strip Live." What you see on stage is what you in private. I also interviewed him for yet another column in the future. The weather was great and it was hot. Marcy earned a sunburn, a bad one. Melissa started to get brown. I had the beginning of a great tan. We had left New York on Tuesday, arriving at San Juan on Friday. It was dripping sweat hot weather. Sometime during the day, I started to cough. As soon as that happened, Marcy said, "You're getting sick again." By the time we arrived at St. Thomas, on Saturday, the cough was much worse. I thought if we walked around, lounged at the beach and relaxed, I could sweat it out. Nope, that didn't work. When we got Grand Turk on Sunday, I still didn't feel well and did all I could to not cough, sneeze or complain. That night, my ears, throat and chest hurt. I knew that I had another upper respiratory infection, bronchitis or an ear infection. I stayed in the cabin most of the day on Monday, only to sit outside on a shaded deck for a couple of hours. On Tuesday, I stayed in the cabin the entire day, only going out for breakfast and dinner. There was no lunch for me that day. Yes, I managed to catch an upper respiratory infection on vacation. As soon as we got on the train to go home, I called my physician to make an appointment for later that morning. Yes, I had another URI and felt like crap. I stayed in bed Wednesday, Thursday and Friday, with plans to go to work on Saturday. Nope, still too sick, so I even napped on Saturday. That's something I can't do at work. Here's the cherry on top. Michelle now has strep throat and Marcy is sick as well. I hope that she'll get to the doctor on Monday. As vacations go, this one came out to a six. Being sick really ruined it.